Request compostable food supplies for your next small gathering! All student orgs and departments are eligible to receive free supplies from the Environmental Stewardship interns. Submit your request at least one week before your event. To request these supplies for something other than an event, email environmentalstewardship@augsburg.edu. 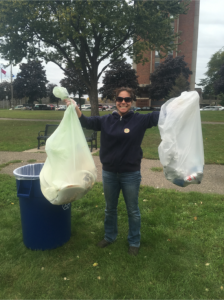 The Environmental Stewardship intern team is available to help sort waste at events! All catering supplies are compostable, but many event attendees can get confused by the options for disposing waste. We’ll come ready with knowledge and cool stickers to encourage learning and increased contributions to our campus-wide sustainability goals! Request a team at your event! Check out the Green Events resources and ask University Events what else you can do to support our sustainability goals with your event.